St. Ambrose (c.340-397), bishop of Milan, was one of the most important early Christian writers. His preaching was also extremely popular and persuasive--so much so, that mothers might prevent daughters from listening to his teachings extolling virginity. The present manuscript was owned in the Middle Ages by Battle Abbey, in Sussex. 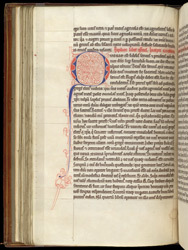 The text is divided in eight books; this initial 'Q' marks the start of Book V; in the left margin is the guide-letter 'Q' in red. Also visible in the outer margins are the prickings, used to guide the ruling of the page.